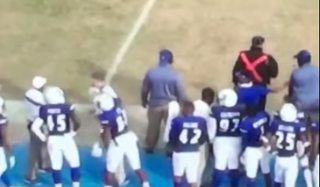 Tennessee State defensive end Latrelle Lee was kicked off the team and then kicked out of the university altogether, after twice punching the Tigers’ head strength coach T.J. Greenstone during Saturday’s game. According to the Tennessean, Greenstone’s job during games is to keep players away from the sideline to avoid getting penalized. There is as of now no explanation of what led to Lee swinging on Greenstone. Lee, a senior from Dothan, Ala. majoring in criminal justice, had started two games this year. TSU won Saturday’s game 23-20 over Southeast Missouri, and is 2-4 in Ohio Valley Conference play.